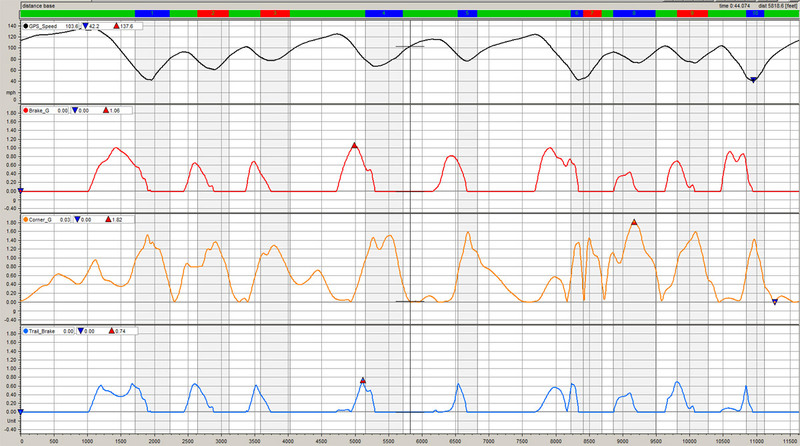 Figure 1: This data shows just the entry to a turn, with speed in black, braking G in red, corner G in green and total G in blue. The shaded areas represent where the rider is trail braking, with a combination of corner G and brake G.
One important aspect of riding a motorcycle well is trail braking – a combination of braking and cornering on the entrance to a turn. When the rider approaches a corner, the brakes must be released as the bike is leaned into the corner and cornering G increases, until the brakes are completely released just as the motorcycle reaches full lean. Using a math channel, it’s possible to put a number on trail braking that can be used for a quick reference. Figure 2: A lap of Mazda Raceway Laguna Seca, with speed (black), braking G (red), corner G (yellow) and trail braking G (blue). 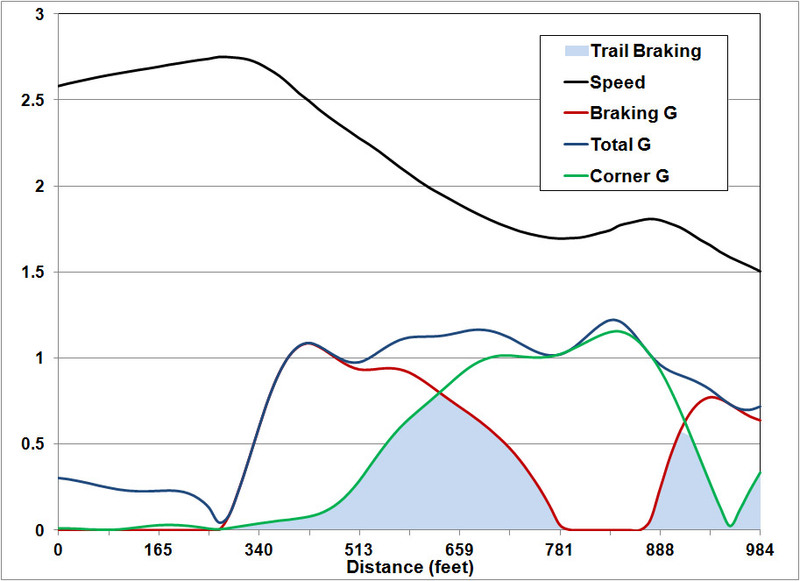 Note the typically triangular shapes of the trail braking G trace; the peaks should always be at a value that can be calculated from the maximum lateral acceleration (and total acceleration) typically seen. Generally, the desired value for total G at this point is equal to or slightly greater than the typical values for lateral acceleration seen during maximum cornering. Note that this peak value only shows trail braking at one point during the corner entry – when the values for corner G and braking G are equal. 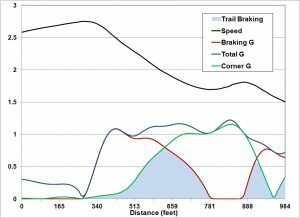 To properly see trail braking over the entire segment, it’s necessary to look at the total G channel and how it varies from its peak value over that time. In this case, the corner G channel shows that 1.2 g is a common maximum lateral acceleration and this gives a trail braking G value of .85. 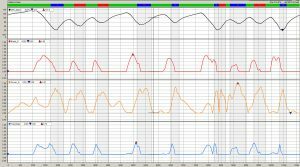 Theoretically, then, the peaks of all the trail braking G triangles should be at this value. Here, the values are typically in the 0.6 g range, indicating that some attention is required either in terms of the rider’s braking habits or the motorcycle’s braking system.